So this is hell. I’d never have believed it. You remember all we were told about the torture-chambers, the fire and brimstone, the “burning marl.” Old wives’ tales! There’s no need for red-hot pokers. Hell is—other people! They were born a year apart but died 9 nine years apart. Irish writer Samuel Beckett (4/13/06 – 12/22/89) and French philosopher Jean-Paul Sartre (6/21/05 – 4/15/80) were both creative geniuses in their own field, yet, still managed to combine both philosophy and literature into a hybrid of elevated art. Both wrote plays that are still relevant today. Both wrote about individuals who are a little out of their realm of reality and settled into their self-imposed world without complaining. Sartre’s play No Exit (1944) is a story of three souls, Vincent Cradeau (Pierre Adeli), Inés Serrano (Hannah Chodos) and Estelle Rigualt (Paulette Zubata) crammed together in a windowless room, with two benches, a chair, a sculpture, letter opener, except for the on again/off again visit of a no name valet who clicks his heels like Dorothy from The Wizard of Oz, actor Cihan Sahin does an excellent job in bringing some comic relief in hell, the soulless wonders have only themselves for miserable company. Estelle is a trophy wife who insists on checking herself in the mirror. The surly Inés toys with the cute blonde saying how she will be her mirror. Inés wants Estelle to look at herself through her eyes. She is insistent that they should stick together and leave Cradeau out of their soon to be close bond. Estelle was a young wife married to a much older man, who had an affair and got pregnant. To make herself feel more attractive, she overtly seduces Cradeau, who cheated on his wife and brought the hussy to their home. He insists he’s in hell for being a pacifist, but Inés doesn’t buy it. She nags the Brazilian military deserter into revealing the truth. Instead, he strongly suggests that they remain quiet. Like that’s gonna happen. They all agree to confess their offenses so they know who they are dealing with and not be surprised. Cradeau admits to mistreating his wife, Inés reveals that she seduced her cousin’s wife and Estelle had an abortion and the father committed suicide. No one’s an angel in this hour and a half drama. 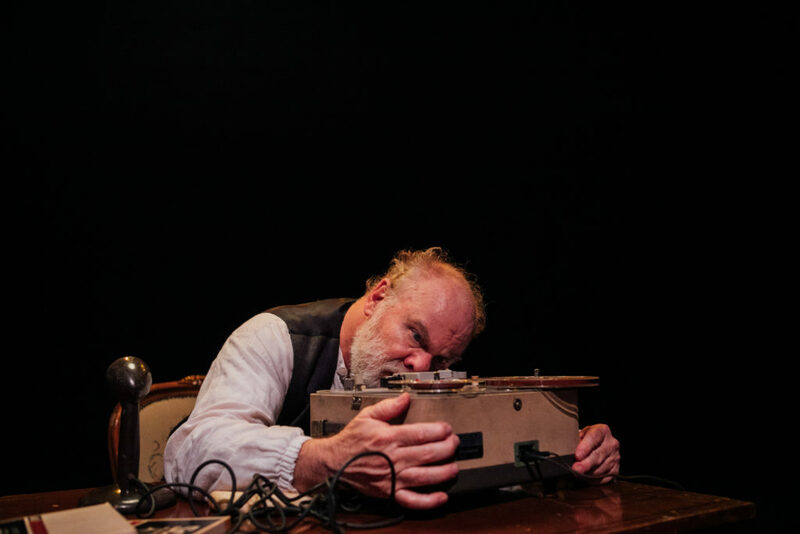 I’ll tell you what hell is, Beckett’s Krapp’s Last Tape. My God, Krapp, an appropriate name, doesn’t speak for 20 minutes! I’m watching while silently thinking, “Say something! Anything! Jesus, speak man, speak!” He eventually does, then I think, maybe he was better silent. His archaic tape recorder does the talking for him but in a gibberish and nonsensical way. Krapp (Steven M. Porter) is a portly older man celebrating his 69th birthday alone. While getting ready to record something new, he listens to a recording he made at age 39. He consults his ledger to remind him of his last entry. Instead, he repeats the word “spool” and eating one too many bananas. Eventually, it becomes a fixture in his mouth moving it up and down. The 39-year-old Krapp concludes that his life, like the rest of us humans, didn’t turn out the way he hoped. Compare that to the 20-year-old Krapp who believed in himself and his goals. Somewhere along the way, he lost track and walked aimlessly hoping for some miracle to step in and take over. Perhaps my best years are gone. When there was a chance of happiness. But I wouldn’t want them back. Not with the fire in me now. No, I wouldn’t want them back. Even though it’s sometimes frustrating trying to follow, Porter does a great job in playing the curmudgeon man who revisits his past with both earnest and regret. Maybe if he removed the banana he would make a wider effort to improve his situation. There is a method to his madness, which is up to the audience to figure out and discuss after the show. After all, the title says it best. 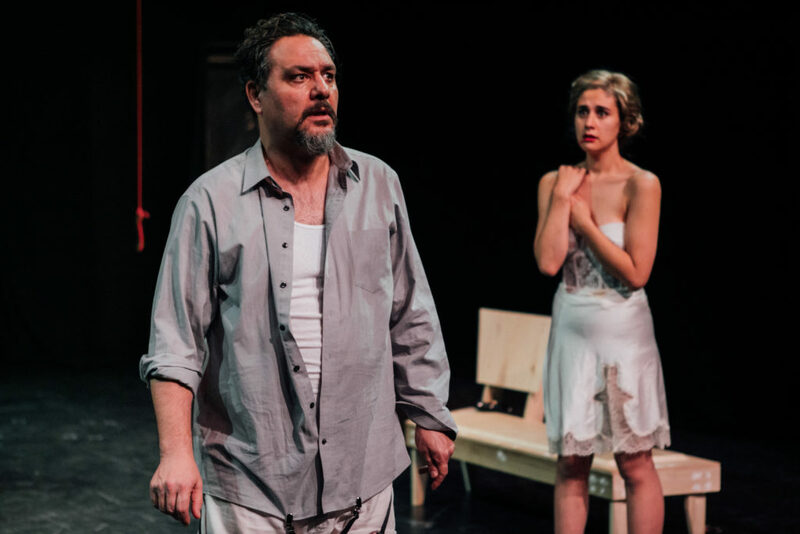 No Exit & Krapp’s Last Tape plays Saturday, April 6th, at 8 p.m., Sunday, April 7th at 2 p.m., Thursday, April 11th, Friday, April 12th and 19th, at 8 p.m. and Saturday, April 20th at 9 p.m., at The Actors’ Gang Theater, located at 9070 Venice Blvd. in Culver City. To reserve online, log on to www.theactorsgang.com.